The world's first* interchangeable 3D lens LUMIX G 12.5mm / F12 (H-FT012) realizes 3D shooting (35mm camera equivalent: 65 mm**)***. It features two optical systems installed within the diameter of the lens mount, creating stereo images from the left and right lenses, to be processed with a 3D image processing system. Despite its unique performance, the 3D lens keeps its size extremely compact thanks to Panasonic's advanced optical technologies and consideration of image processing system as well as structural design. Shooting 3D content with an interchangeable lens system camera was possible by using panorama systems or a combination of two lenses and two CCDs, but these systems have drawbacks including the need for a dedicated 3D camera and the difficulties capturing moving objects. 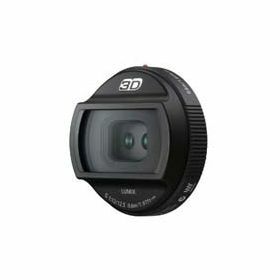 However, this new compact 3D-capable interchangeable lens allows easier handling and instant 3D shooting with cameras without a special structure for 3D shooting. It produces 3D images without distortion or time lag between left and right images, even for moving objects. The 3D images, even close-up shots, taken with this lens are easy on the eyes when viewed on 3D VIERA televisions. In 2010, Panasonic has spearheaded the industry by launching 3D-capable VIERA televisions and 3D Blu-ray Disc players. While 3D content, including movies and sports, has become more widely available for viewing, there are many customers who want to enjoy 3D shooting themselves. This new lens will respond to such demands. This lens allows users to shoot landscapes, people, and a variety of subjects in high-quality 3D, to be enjoyed later with their 3D VIERA televisions at home. 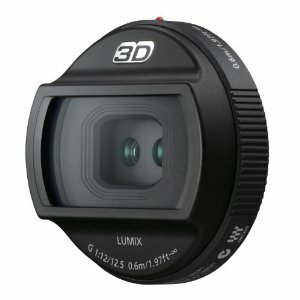 As 3D content becomes ever more popular across a variety of media, Panasonic is leading the industry in bringing a true-to-life 3D experience to the customers, and even a fun of creating it by themselves utilizing the LUMIX G Micro System. * For a digital interchangeable lens of September 21, 2010. ** When setting the aspect ratio at 16:9 with the DMC-GH2. *** Compatible with DMC-GH2 and DMC-G2 with the firmware ver.1.1. A 3D media player that supports the MP (Multi-Picture) format is required to view 3D images.